1. 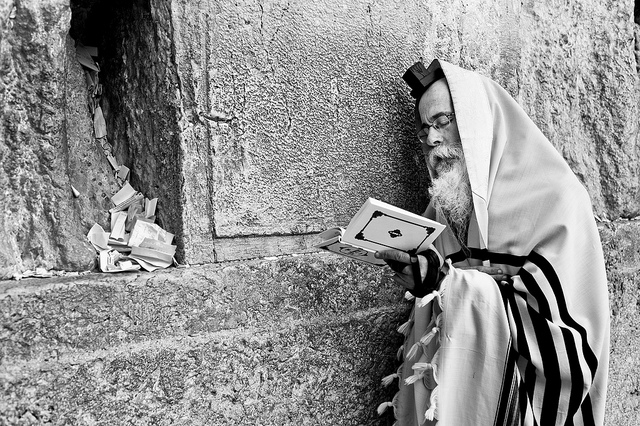 There are certain rituals in Judaism which are referred to in the Torah as an ‘Ot’ – a sign of the binding relationship between the Jew and G-d. The Shabbat is called an ‘Ot’; circumcision is described as an ‘Ot’; the Mitzvah of Tefillin joins the group of ‘Otot’. Soldiers of the Israeli army (IDF) putting Tefillin privately, close to the Kotel and during combat. 2. 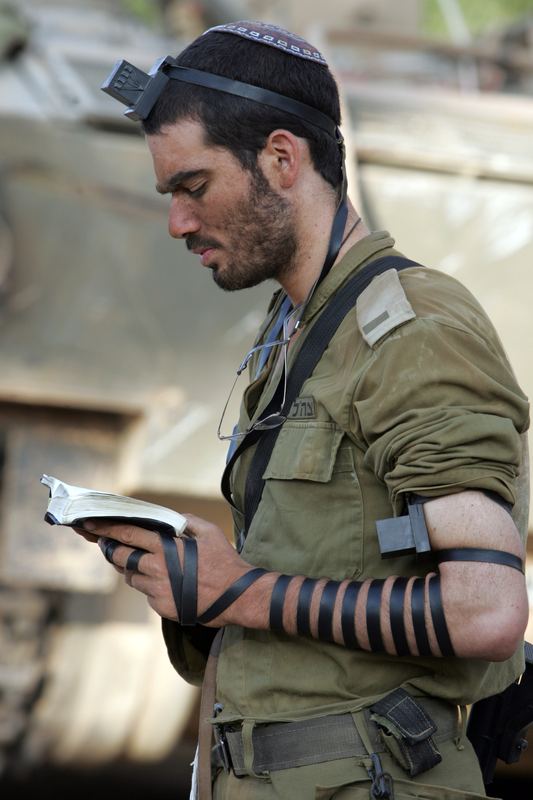 There are two Tefillin, one is placed on the arm (‘shel Yad’) and the other on the head (‘shel Rosh’). They are two four-cornered hard-leathered (from skin of a kosher animal) boxes. 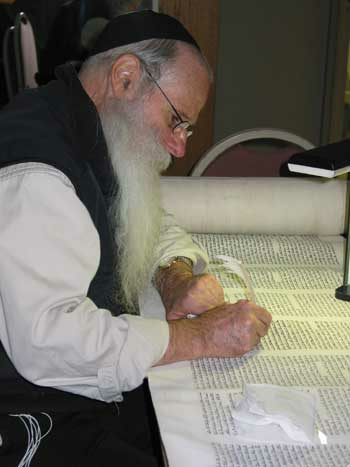 A piece of parchment made from the hide of a kosher animal is placed into the ‘Tefillah shel Yad’, on which four extracts from the Pentateuch are inscribed. These sections are: Shemot/Exodus 13: 1-10, 11-16 and Devarim/Deuteronomy 6: 4-9, 11:13-21. 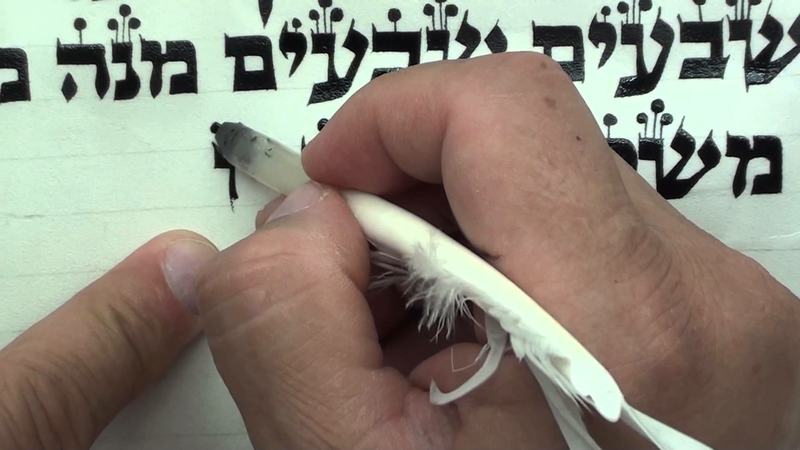 Four separate pieces of parchment are placed in the ‘Tefillah shel Rosh’, which has four sections, each containing one of the same four passages. 3. The ‘Tefillah shel Yad’ is tied with ‘Retzuot’, leather-straps of a kosher animal, to the muscle of the left arm (if the wearer is right-handed) and facing the heart. 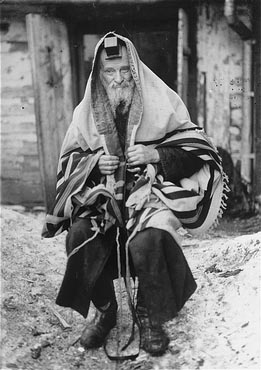 The ‘Tefillah shel Rosh’ is placed on the head, not behind the fontanel nor below the hairline. 4. These are considered two separate Mitzvot with two extra ‘Berachot’. Thus if one has an arm missing, he is yet obligated to wear the ‘Tefillah shel Rosh’. 5. On the Shabbat we do not don Tefillin. Because Shabbat itself is an ‘Ot’; there is no need for three ‘Otot’ on the same day. The ‘Brit’ (circumcision) is an everlasting ‘Ot’ during our entire life time. Shabbat is referred to as an ‘Ot’ as well as the Tefillin. A Jewish man is always accompanied by two ‘Otot’. Left: Nazi-German soldiers of the ‘Wehrmacht’ mocking and ridiculing a Jew while praying in front of massacred Jews. 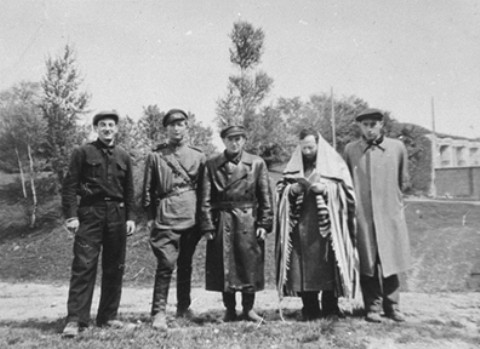 Right: Russian soldiers of the ‘Red Army’ honouring a Jew who is practising his religious duties. 6. Originally, Jews wore their Tefillin all day and removed them only at night. Due to the circumstances in the Diaspora, the Mitzvah of Tefillin is now (normally) only carried out in the morning. The least one can do is to wear Tefillin during the recitation of the Shema and the silent prayer of the ‘Amidah’. Because there are eight chapters of the Torah inscribed in the two Tefillin, four in the ‘Tefillah shel Rosh’ and four in the ‘Tefillah shel Yad’, failing to put on the Tefillin is regarded as a violation of the eight positive commandments. 7. Tefillin are worn only during the day. Since there is a time-element involved (they are not worn on Shabbat and Yom Tov), it is not incumbent upon the woman to fulfil this Mitzvah. 8. There is a fundamental difference between Rashi (1040-1105 C.E.) and Rabbeinu Tam (1100-1171 C.E.) regarding the sequence of the four Torah-sections. Rashi along with most great Halachic authorities follow the same sequence as the sequence of the sections in Torah. 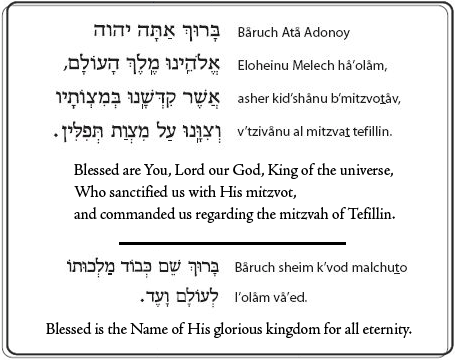 Halachically we rule according Rashi and so we say only the ‘Berachot’ on the ‘Tefillin shel Rashi’. Rabbeinu Tam, Rashi’s grandson, disagreed with his grandfather and follows a different order. Chassidim and Kabbalists put ‘Tefillin shel Rabbeinu Tam’ after ‘Shemoneh Esreh’, without saying a ‘Berachah’. It is noteworthy that in Masada, the last citadel of Jewish resistance against the Romans, Tefillin were found, some following the sequence of Rashi and also Tefillin following the sequence of Rabbeinu Taum. 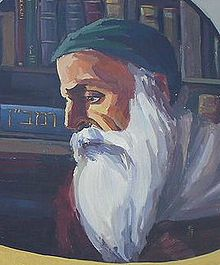 Rabbi Ahron Halevi (1235-1290 C.E.) ‘Chinnuch’: Man is composed of flesh and blood and, as such, he is subject to many sensual lusts; but he also possesses an opposing force – his soul. The soul deters him from engaging solely in the pursuit of the pleasures of the flesh. The soul, emanating from Heaven, is operating far from its base when it is dealing with earthly lusts. Hence it sometimes becomes weak and ineffective and the lusts of the body overcome the prudence of the soul, with the result that the soul requires assistance. One of the guardians of the soul in its battle with the body is the Mitzvah of Tefillin. By wearing Tefillin we help to tip the scale in favor of the soul. 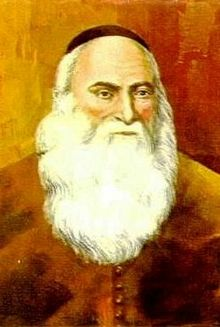 Rabbi Don Isaac Abrabanel (1437-1508 C.E. 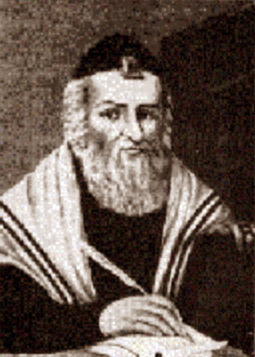 ), Rabbi Moshe Alshekh (1508-1593 C.E. ): By wearing the Tefillin on the arm and on the head, indicating that the work of our hands and the thoughts of our brains must be dedicated to G-d, we have a constant reminder not to follow the dictates of evil inclinations. Rabbi Recanati (1250-1310 C.E. ): Because G-d shows pride in His one and only chosen people, so must we, too, exhibit our pride in the One and Only G-d. In the Tefillin, we insert the prayer of the Shema; our acknowledgment of the oneness of G-d serves to remind us of this. The commandment of Tefillin is mentioned in the Shema (Devarim/Deuteronomy 6:4-9), and three other times in the Torah (Shemot/Exodus 13:9, 19:16 and Devarim/Deuteronomy 11:18). A commandment repeated four times in the Torah is of more than ordinary importance. The greatest love is the love between G-d and man. G-d’s very act of creation was an act of love. This bond of love exists always, even when we do not deserve it. G-d is a Father Who loves His children even when they go astray. It is our duty, however, to strengthen this bond. Tefillin are a sign of this bond of love. 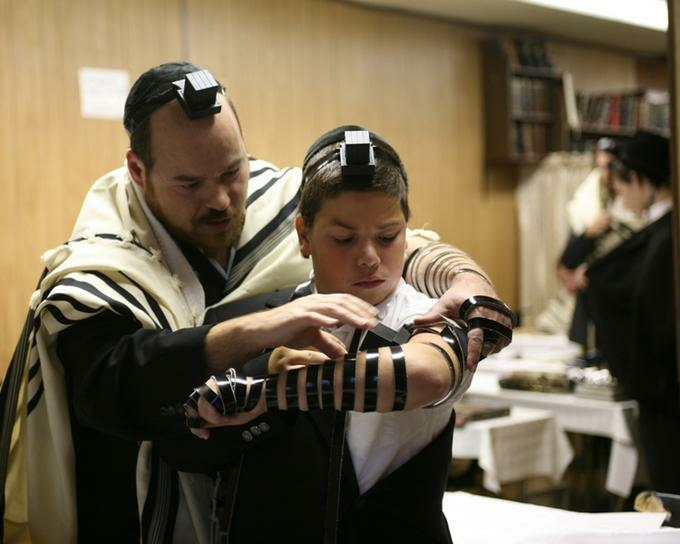 Educating and teaching a ‘Bar Mitzvah’ boy to put on Tefillin. “With all your heart.” The hand Tefillin are worn on the left hand opposite the heart. We thus dedicate our heart, the seat of life, to the love of G-d.
“With all your soul.” The head Tefillin are worn next to the brain, the seat of man’s soul and intellect. We thus dedicate our mind to the love of G-d.
‘With all your might.” The hand Tefillin are bound to the arm, the symbol of man’s strength. We thus dedicate all our powers to the love of G-d. The essence of the Torah is its commandments, Mitzvot in Hebrew. The word Mitzwah comes from a root meaning “to bind.” Every commandment or Mitzvah serves to draw us close to G-d and strengthen this bond of love. With every Mitzvah we forge a spiritual bond with G-d. In the case of Tefillin, this bond is physical as well as spiritual. We literally bind G-d’s love symbol to our bodies. Another theme of the Tefillin is the Exodus from Egypt - “And it shall be a sign … because with a strong hand G-d brought you out of Egypt.” The parchments in the Tefillin speak of the Exodus. The Tefillin thus serve to bind us to our past, especially to this unique event in our history. All of G-d’s people heard the voice of G-d at Sinai and attained the level of prophecy. There are many ways to approach G-d.
- On an intellectual level: You can ask questions and seek answers until you achieve some understanding of the Infinite. This is the realm of the philosopher. - On a more intimate level, in prayer and in meditation. You catch a glimpse of the Divine, and discover something more wonderful than anything on earth. Somehow you feel a unique closeness to G-d. This is the level of the mystic. Sometimes the door is opened all the way. A man experiences more than merely a glimpse. He hears a clear voice and receives a lucid message. This is the highest possible human bond with G-d. It is the level of the prophet. At Sinai, every Jew attained this level. Tefillin bring us back to this unique moment. When we bind the Tefillin to our bodies, we relive the infinite bond of love that was forged at Sinai. 1. Kadesh (Shemot/Exodus 13:1-10), containing our obligation to remember the Exodus. 2. VeHayah Ki YeViacha (Shemot/Exodus 13:11-16), speaking of our obligation to transmit this tradition to our children. 3. The Sh’ma (Devarim/Deuteronomy 6:4-9), speaking of G-d’s unity and our mutual bond of love. 4. VeHayah Im Sh’moa (Devarim/Deuteronomy 11:13-21), declaring man’s responsibility toward G-d.
Tefillin shel Yad (hand Tefillin) from left to right: from inside, the parchment and how it is put on the left hand. Besides these four texts, the Torah tells us nothing at all about the Tefillin. It is most important to realize that G-d gave us the Torah in two parts. There is the Written Torah and the Oral Torah, consisting of the oral tradition handed down from Sinai. 3. The parchments must be tied shut with the hair of a kosher animal. 4. They must be placed in a perfectly square leather box. From left to right: Tefillin shel Rosh (head Tefillin) from outside. Notice the division into four departments, each for one section of the Torah. Middle: Tefillin shel Rosh from inside. On the right you see the famous ‘Shin’ on Tefillin shel Rosh with the four prongs, which is a Sinaitic tradition. On the day a Jewish boy reaches his thirteenth Hebrew birthday, he becomes Bar Mitzvah and has the duty of keeping G-d’s commandments, like wearing Tefillin. You can fulfil the commandment of Tefillin by just putting them on and immediately taking them off. It need not take more than a few minutes. If possible, you should also say the Sh’ma while wearing the Tefillin. If you cannot put on Tefillin in the morning, you can do so any time of the day until dark. If you have not put them on in the morning, you may say the afternoon Minchah prayer wearing Tefillin. Tefillin are never worn at night, neither on the Sabbat or on festivals mentioned in the Torah, such as Rosh HaShanah, Yom Kippur, Sukkoth, Pesach or Shavuot. 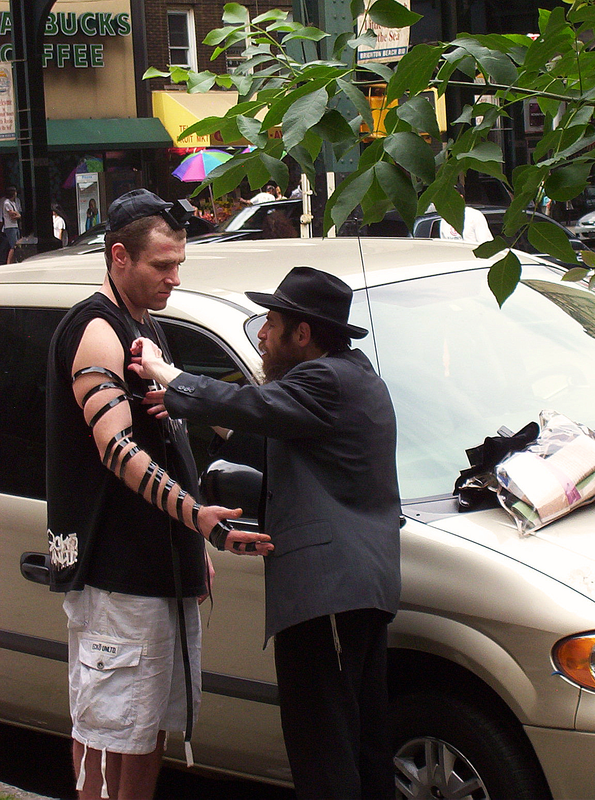 The Tefillin are put on the arm first. This is the Tefillin shel Yad or hand Tefillin. They are worn on the the left hand. A left-handed person wears them on the right. The strap is then tightened by pulling it forward the right. It is customary to wind it toward the body. Chassidic and Sephardic Jews, however, wind it away from the body. The strap is wound seven times around the forearm. The black side of the straps must always be on the outside. Now wind the strap once or twice around the palm of the hand so that it can be held. You are now ready to put the Tefillin on your head. 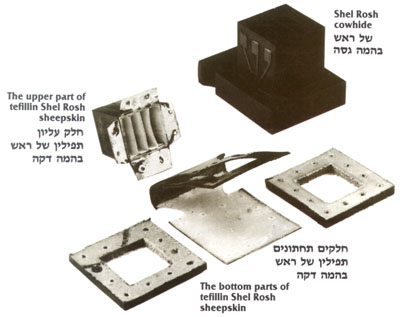 These are the Tefillin shel Rosh or head Tefillin. The head Tefillin should be centered in the middle of the head and worn just above the hairline. You are now ready to complete the windings of the hand Tefillin. I will wed You to me with faith… and you shall know G-d. When you remove the Tefillin, you reverse the process. 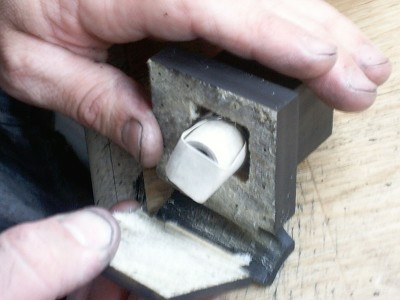 First unwind the three coils from the finger, then remove the head Tefillin, and finally take off the hand Tefillin. 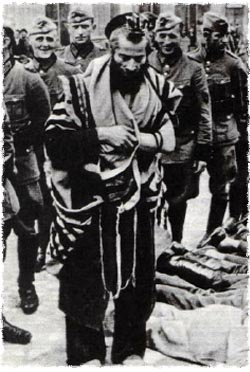 If you wear a Tallit, it is removed after the Tefillin. The greatest good that G-d can offer us is our ability to approach G-d and resemble Him. 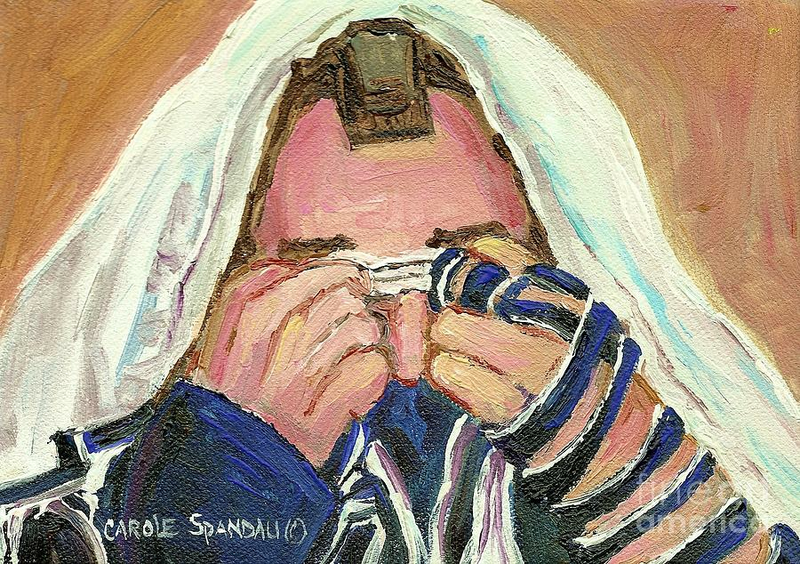 When we wear Tefillin, we are projecting ourselves in the image of G-d wearing Tefillin. Why did G-d create the physical world? G-d Himself is certainly spiritual, and so is the Good that He has to give. The entire purpose of creation is essentially spiritual in scope. Then what necessity was there in creating a physical world at all? The main difference between the spiritual and the physical involved the concept of space. Physical space exists only in the physical world. In the spiritual domain, there is no concept of space as we know it. But still we speak of things being close or far apart in the spiritual world. What does this mean? We cannot be speaking of physical distance, for there is no physical space in the spiritual realm. But in a spiritual sense, closeness involved resemblance. Two things that resemble each other are spiritually close. 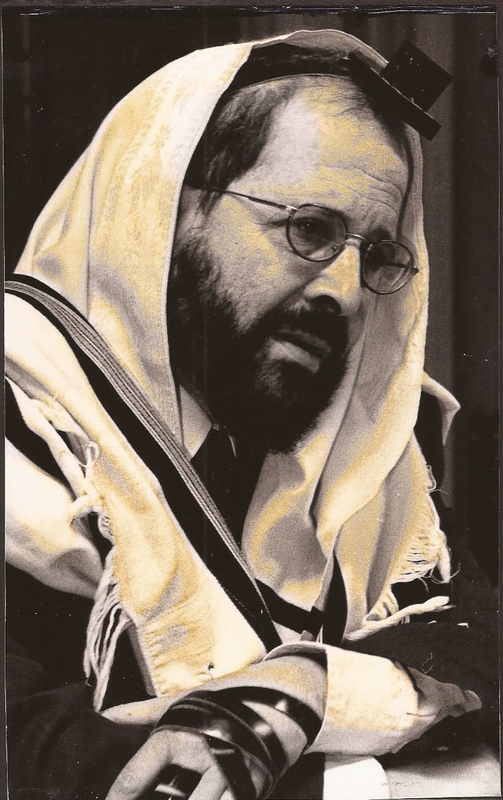 Famous Rabbis from the past adorned with Tefillin. From left to right: The ‘Gaon of Vilna’ (1720-1797 C.E. 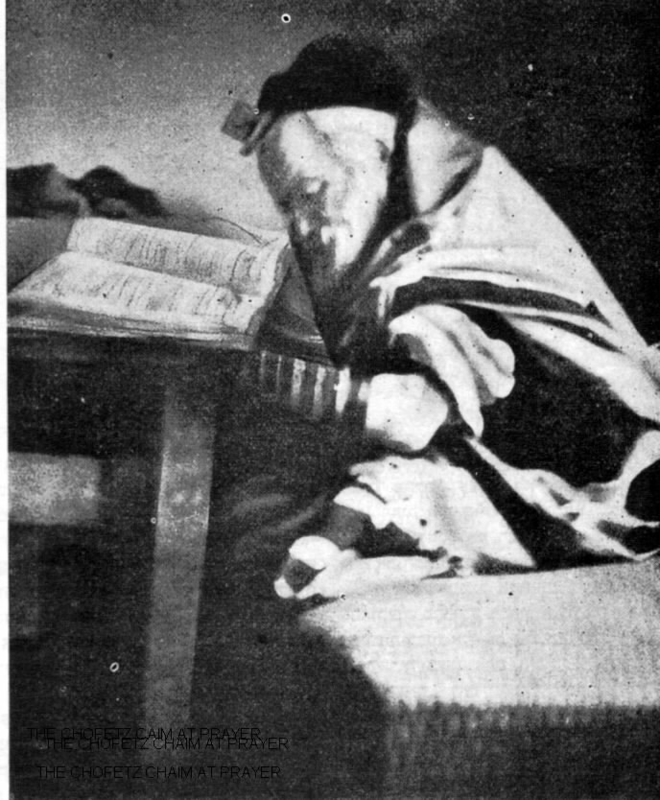 ), ‘Chofetz Chaim’ (1838-1933 C.E.) 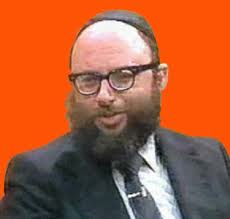 and Rabbi Moshe Feinstein (1895-1986 C.E.). In the spiritual world, it is impossible to bring two opposites together. Because they are opposites, by definition they are poles apart. But spiritual things can be bound to the material, just as the soul is bound to the body. Two opposites can be brought together when they are both bound to the same material object. G-d and man are worlds apart. On a purely spiritual plain, it would be totally impossible for the two ever to be brought together. It is only here in the physical world that G-d and man can come together. Both can bind themselves to the same physical object or action. 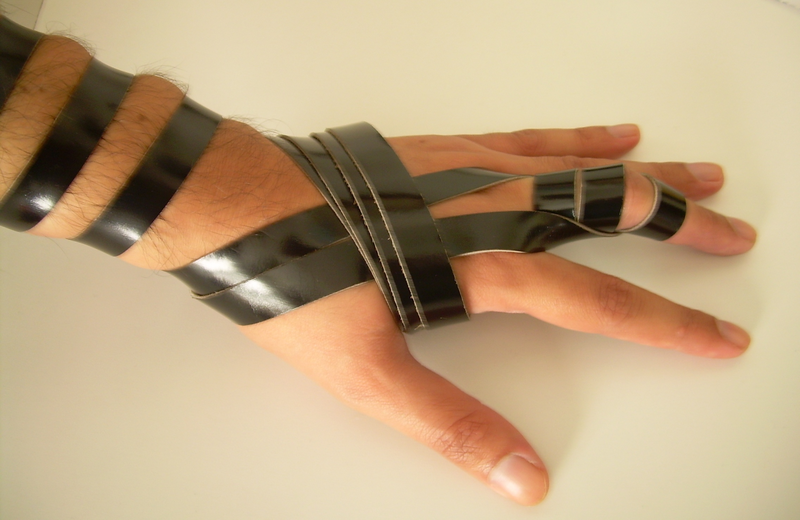 The physical Tefillin we wear as a counterpart of the Tefillin on high. In each detail, they parallel G-d’s spiritual Tefillin. 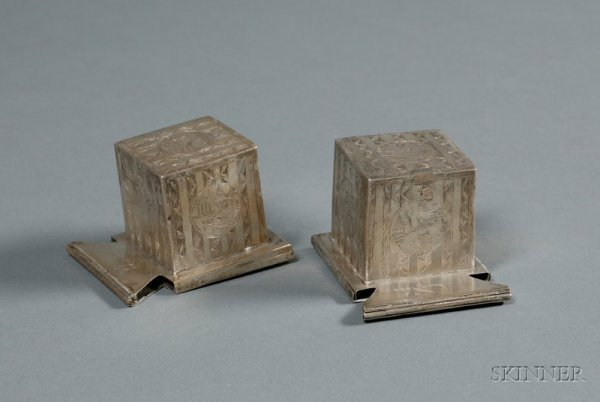 And because they resemble these Tefillin, they are spiritually very close to them. G-d’s Tefillin are on the very Crown of creation. They exist at the very highest transcendental level. When a man wears Tefillin, he therefore binds himself to the very highest spiritual level. He achieves a closeness to G-d that even the deepest meditation could not accomplish. It is G-d’s will that we wear Tefillin. Our physical Tefillin are therefore intimately bound to G-d’s will. The same if true of all the other Mitsvot. The word Mitzvah comes from a root meaning ‘to bind.’ Through the physical act of doing a Mitzvah, we literally bind ourselves to G-d. 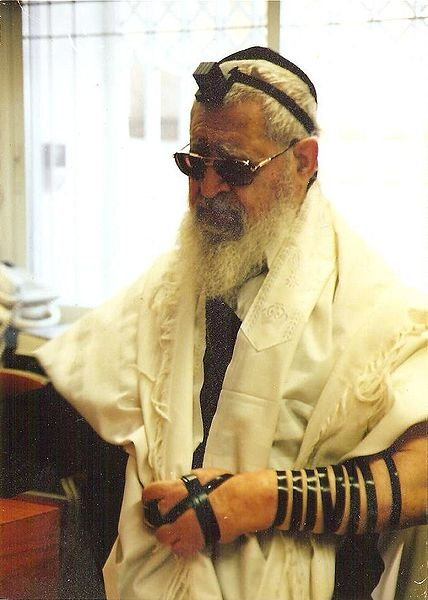 Famous Rabbis from the recent past and the present wearing Tefillin. 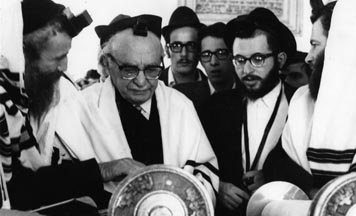 From left to right: the last Lubavitcher Rebbe (1902-1994 C.E. 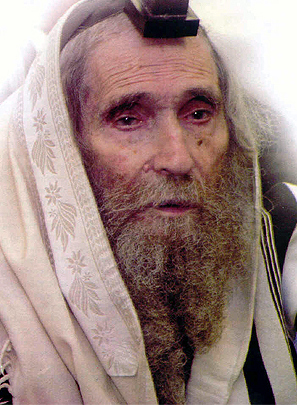 ), HaGaon HaRav Yosef Shalom Eliyahsiv (1910-2012 C.E.) and Rabbi Ahron Steinman (1914 C.E.). The number four is very closely linked with Tefillin. There are four parchments inside four boxes. The shape of Tefillin is a four-sided square. The head Tefillin knot is in the shape of a Dalet, the fourth letter of the Hebrew alphabet. There is an unusual four-headed Shin on the head Tefillin. G-d’s ways are hidden from man. The parchments are therefore hidden in a black box. The Tefillin must be square. Our sages teach us that the square is the archetype of that which is manmade rather than natural. The ultimate goal depends on man. 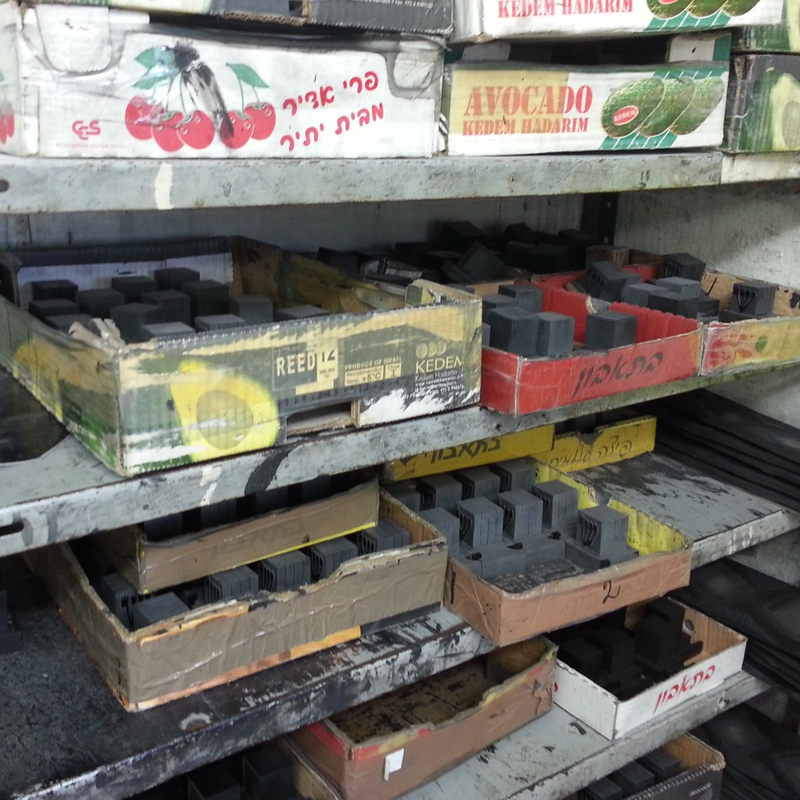 A Tefillin atelier in Israel where the ‘batim‘ (square leather boxes) are manually prepared and then get the beautiful black colour with a special ink. The Tefillin boxes must be sewn with the veins of a kosher animal. Our sages teach us that there are 365 main veins in the body, corresponding to the 365 days of the year. The boxes are sewn with twelve stitches, representing the twelve months of the year. The head Tefillin are inscribed with the letter Shin. In this letter, all the heads are connected to a single base. This shows that all forces are ultimately directed toward one goal. The two straps emanating from the head Tefillin to the right and left represent the two basic forces of creation, love and judgment. 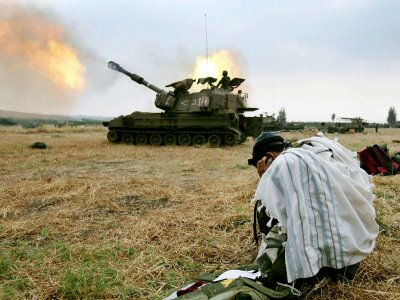 While sometimes G-d’s love would dictate mercy, His judgment demands retribution. Ultimately, G-d’s justice is a combination of the two. This is represented by the knot, binding the two sides together. The hand Tefillin are bound with a knot in the shape of the letter Yud. This letter always symbolizes the ultimate good in the World to Come. G-d’s action is guided by His ultimate goal which is this Future World. The letter Yud is also the final letter of the Name Sh-day, the Name associated with G-d’s providence. Together with the Shin of the head Tefillin, and the Dalet of its knot, the Tefillin spell out this Name. Cartoon picture about Rashi’s life as he is represented in the cartoon. The order of the sections in our Tefillin follows the order of Rashi (10140-1105 C.E.). His grandson, Rabbenu Tam (1100-1170 C.E. ), has a different order, which is practised by Chasidim and Kabbalists. 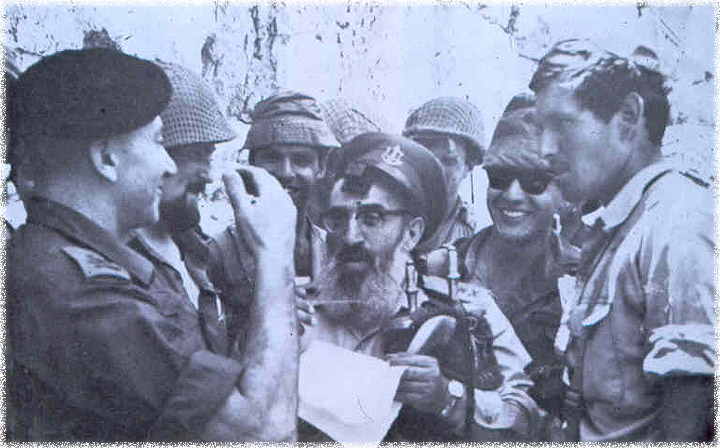 Chaplain Chief Rabbi of the Israeli army, Rabbi Shlomo Goren (1917-1994 C.E. 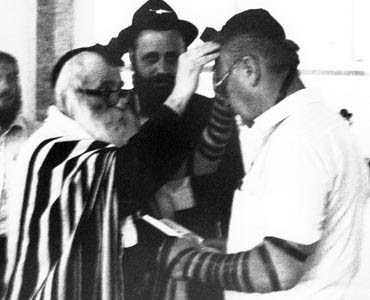 ), adorned with Tefillin at the liberation of the ‘Kotel’ in June 1967 C.E. after 17 years of captivity under Jordanian occupation when no Jew was allowed to visit it. Although the text of the Torah commandment does not tell us anything about the appearance of Tefillin, the Oral Tradition (‘Halacha le’Moshe mi’Sinai’) specifies the details. Around the world, in all Jewish communities, Tefillin are black, square, leather boxes containing specific parchments. Archaeologists in Israel have uncovered Tefillin dating back 1800 years, and they too are black (although somewhat laded), square, leather boxes containing the same parchments. 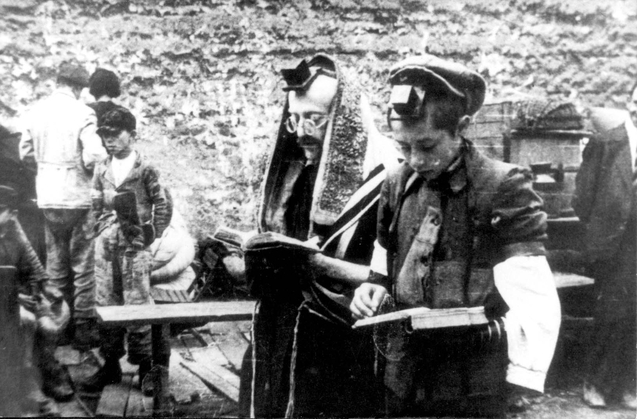 Our ancestors living in Israel just after the Roman destruction of the Second Temple, wore the same Tefillin that we wear today, as taught by the same Oral Tradition. What message and symbols lie in these detailed laws that we have so carefully preserved? 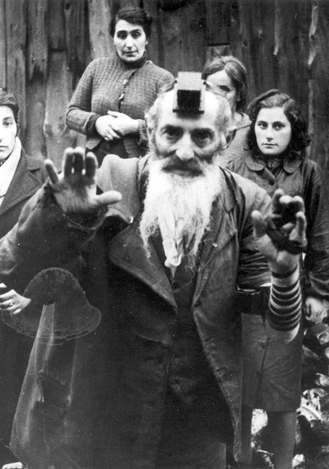 Pre-Shoah East-European ‘shtetl’ where Jews openly adorned with Tefillin fearlessly showed themselves in public. The leather boxes and the leather straps of the Tefillin must be uniformly black. Maimonides (1135-1204 C.E.) explains that this enhances the beauty of the Tefillin, and there is no question that Tefillin with a deep, even black colour have an elegant and dignified look. In addition to the aesthetic value, however, the Torah’s choice of this colour has a deeper meaning as well. The sensation of blackness is due to a lack of stimulation of the retina (light-sensitive layer of tissue, lining the inner surface of the eye). This occurs because little or no light is reflected from a black surface. 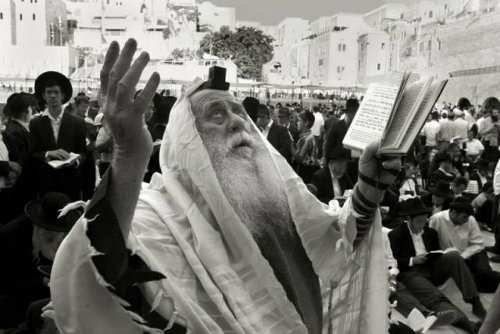 The smooth, featureless black surface of the Tefillin thus suggests the unique and invisible Oneness of G-d, which is not reflected in anything else and to which nothing else can be compared. Black also indicates lack of illumination, as if the Tefillin are saying to us that, although we must strive for closeness to G-d and we can achieve closeness, we must nevertheless not be under the illusion that we will ever be able fo fully comprehend G-d and His infinite reality. 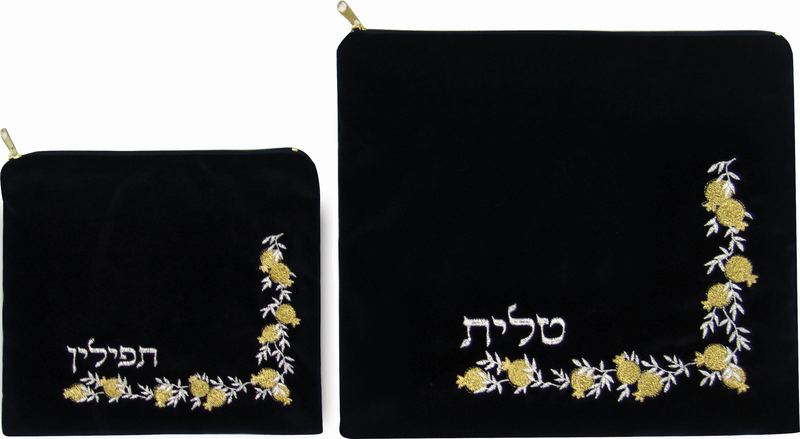 Left: A special velvet bag usually with the initials of the owner to protect the Tefillin and Tallit. 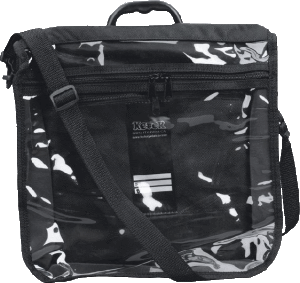 Right: A specially designed bag to carry the Tallit easily, as well as Tefliin and Siddur, and to protect them from the rain. Some feminist and Reform-groups have difficulties in accepting the reality that women are not obliged and required to put on Tefillin. I am not a psychologist, but sometimes have the feeling that they are not happy and satisfied with their role as wives and mothers. And therefore they strive to be liberated, and like their counterpart, men. These women like to cite that the Talmud mentions that Michal, daughter of king Shaul and wife of King David, used to put on Tefillin. Unfortunately Michal has a very negative evaluation and reputation in Judaism. She was mocking King David when he was dancing in front of the Ark of the Covenant, bringing it to its final destination. And as a punishment, she was barren. Some of the women like to cite the daughters of Rashi (1040-1105 C.E.) as having put on Tefillin. This is only a myth, and there is no historical proof to be found in medieval rabbinical sources. 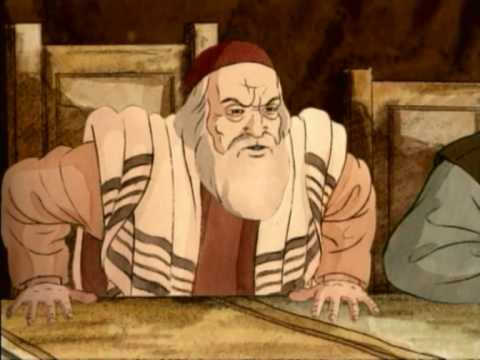 If those feminists would have had a father like Rashi, most religious Jews wouldn’t mind (them putting on Tefillin), but unfortunately no one of us is privileged to have a father like Rashi. A ‘Sofer’, a scribe of Torah, Tefillin, Mezuzah and Megillah, carrying out the holy task of preserving Jewish tradition for future generations. The Oral Tradition rules that women are exempt from obligations that are ‘time bound’, i.e., those commandments that must be performed at specific times. Some exceptions apply, such as Shabbat and Festivals, which women are obligated to observe. One of the more obvious consequences of this rule is that women do not wear either Tefillin or Tallit. Since both are obligatory only during daylight hours (and are customarily worn only during prayer times), they are considered ‘time bound’. In all other areas, such as the Mitzvot related to morality, all prohibitions and the overwhelming majority of positive Mitzvah obligations, women and men are equally obligated. What is the logic behind this exemption? Some commentaries maintain that the Torah exempted women from the time-bound commandments because most women are involved in educating and caring for children, a job that has no fixed hours, and few, if any, breaks. Infants do not care if it is time for the morning service, and toddlers want and need attention (now!) at any time. 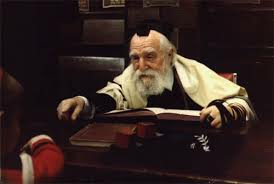 Something as essential as the creation of the Jewish people and the education of Jewish children may not be abandoned even temporarily for these other Mitzvot. Just as we would not interrupt surgery to call the physician for jury duty, Jewish law does not interrupt the Mitzvah of educating and parenting for other commandments, because it views these as having greater spiritual value than many other commandments. 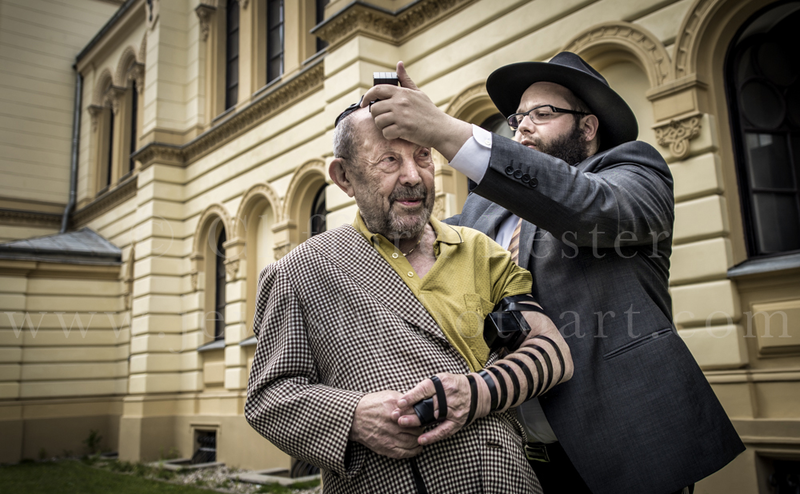 An elderly Jew adorned with Tefillin and covering his eyes with the Tzitzit while saying the main prayer of the Sh'ma. All Mitzvot are finely tuned techniques to help us fulfil our greatest spiritual potential. Beyond any practical consideration, the fact that women are exempt from time-bound commandments must reflect particular spiritual qualities that differ from men. This also explains why the exemption also applies to women who are not involved in parenting. Some commentaries see this exemption as an indication of women’s spiritual advantage. 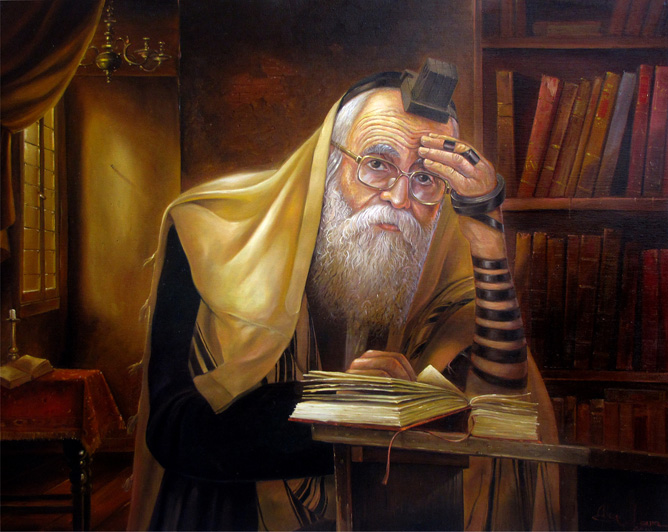 Since men are generally regarded by Judaism as more aggressive and less likely to find calm moments of contemplation in which to connect to G-d, the Torah provided them with commandments that have specific time limitations which force men to calm down, slow down and meditate. Women are seen as naturally more calm, serene and contemplative and therefore require fewer physical reminders (such as Tzitzit) and ‘time-outs’ (such as specific times for prayer) than men. 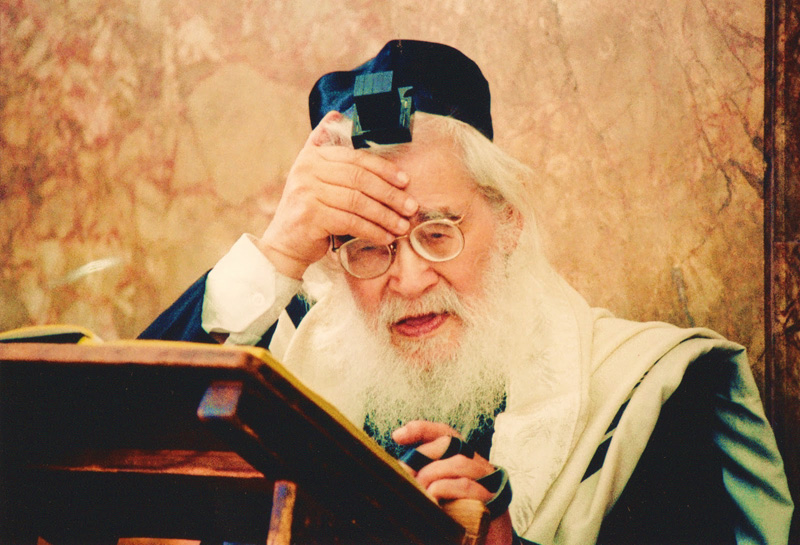 Lubavitch Chassidim by command of the last Rebbe of Lubavitch, Rabbi Menachem Mendel Schneersohn (1902-1994 C.E. ), are engaged in benefitting Jews regardless of their level of religiosity in laying Tefillin at least once in their lifetime. There is one unique way that women resemble G-d in a way that no man could ever hope to. Only a woman can create within her body. Only a woman can bear a child. In this sense, a woman partakes of G-d’s attributes more intimately than any man. The Kabbalists teach us that the hand Tefillin represent the feminine element. The single hollow can be said to represent the womb, and the coils, the umbilical cord. What man partakes of with an object, woman partakes of with her very body. 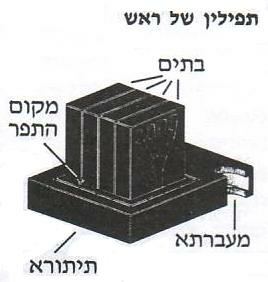 The box of Tefillin is called a Bayit – literally a house. The woman also has her Bayit – the home in which she raises a family. One could say that a woman’s home is her Tefillin. Except for these few brief references to Tefillin in the Torah, almost all the laws connected with Tefillin were conveyed orally to Moses on Mount Sinai (‘Halacha le’Moshe mi’Sinai’). In other words, the Torah itself does not tell us how Tefillin are to be made nor does it give precise instructions on how they are to be worn. Apparently Tefillin were so taken for granted as a Mitzvah which everybody kept, that the traditions passed down by word of mouth were sufficient to assure its continuity. Even the Mishna did not find it necessary to go into the subject at any length, because when it was compiled the Mitzvah of Tefillin was universally observed. Later, however, as identification with this Mitzvah weakened its hold, the Rabbis of the Talmud began a systematic and detailed description and analysis of Tefillin. It is interesting to note that the Rabbis chose the name Tefillin and not the biblical names ‘Ot’and ‘Totafot’, because Tefillin are mostly worn during the prayer (‘Tefillah’). The three strokes correspond to the threefold recitation of ‘Kadosh, Kadosh, Kadosh’ during our prayers. The four strokes correspond to the four occasions during the service when the ‘Kaddish’ is recited by the ‘Chazan’. Different traditions of forming the ‘Shin’ of the word ‘Sh-ddai’ on the palm of the hand. 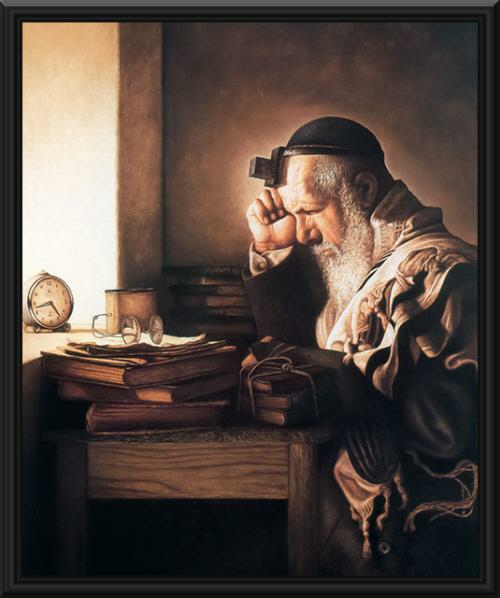 Now the question arises as to the correct time for putting on Tefillin in the morning: when does the day actually begin? Here, too, the authorities base their views on the Torah: ‘And all the nations of the earth shall see that you are called by the name of the Lord’ (Devarim/Deut. 28:10). We have already noted that the ‘Shin’ on the ‘Tefillah shel Rosh’ represents the Name of G-d. So, Tefillin must be worn when ‘all the nations of the earth shall see the ‘Shin’. The Rabbis deduced that we can put on Tefillin when there is enough light for two acquaintances to recognize each other. There are occasions when one is not allowed to put on Tefillin. For instance, one is not supposed to lay Tefillin at night, because the Torah (Shemot/Ex. 13:10) tells us to fulfil this Mitzvah ‘Miyanim Yamimah’. This is commonly translated from ‘year to year’. However, the root of these two words is ‘yom’, daytime. Thus, the Rabbis have interpreted the phrase to mean that the Mitzvah of Tefillin is to be carried out only during the daytime. As already noted, the Shabbat and Holidays are occasions when the Jew is not supposed to put on Tefillin. This is because the Torah refers to the Shabbat, Tefillin and Circumcision as ‘Ot’, an unique sign. Shabbat being the sign of Israel’s awareness that G-d created the world in six days and finished the creation on the seventh, Circumcision being a stamp on the body of the Jew affirming a sign by means of which the Jew confirms that it was G-d’s power (literally hand) that brought the Jewish people out of Egypt. 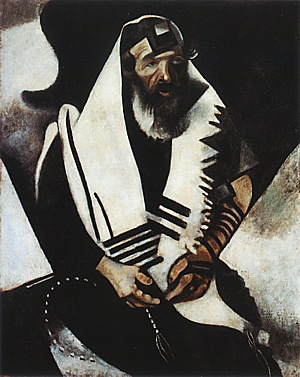 A beautiful painting of a religious Jew being adorned with Tallit and Tefillin. In Jewish jurisprudence testimony must be substantiated by two witnesses. Therefore, during the weekday, the Jew’s submission to G-d is attested ‘Ot’ by two witnesses - the sign of the Tefillin and the sign of circumcision. On Shabbat, the day itself is a sign and corroborated by the testimony of the circumcision, hence Tefillin are unnecessary. If Tefillin were to be put on the Shabbat, the whole concept of testimony would be overdone and lose its importance. Holidays, like the Shabbat, also constitute such signs. The question whether Tefillin should be worn during the intermediary days of a Festival (‘Chol Ha’Mo’ed’) brought into focus sharp a difference of opinion. Are these days considered an integral part of the Festival and so exempt from Tefillin or are they regarded as ordinary weekdays? 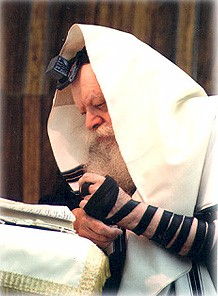 Some of the authorities who are opposed to the putting on of Tefillin base their decision on the Zohar where we are told that laying Tefillin during ‘Chol Ha’Mo’ed’ would be an affront to G-d, Who, figuratively speaking, wears Tefillin as a sign of joy that His people are celebrating a holiday on earth. By himself putting on Tefillin, however, during this part of the holiday (as if they were ordinary weekdays) the Jew, as it were, cuts short the joy of G-d. Those who are in favour of putting on Tefillin hold the view that days when one is permitted to work should be treated as weekdays. Sephardim and Chassidim do not wear Tefillin on intermediary days because their ritual is very much influenced by Kabbalah. Most Ashkenazi Jews, however, do wear them, except in Israel where the Sephardic practice has gained unanimous acceptance. During the day when a close relative (one of the 7 close relatives: father, mother, brother, sister, son, daughter and husband/wife) has passed away, the mourner should not wear Tefillin. A verse in Amos (8:10) is the basis for this view: ‘And its end shall be a day of bitterness’. The idea is that the day when a close relative dies is a sad one for all who care for him. In Yecheskel/Ezekiel (24:17) the Prophet encourages the people by saying that there will be an end to mourning, that in the future: ‘you shall place your diadem upon you’, which the Rabbis interpret to mean Tefillin. 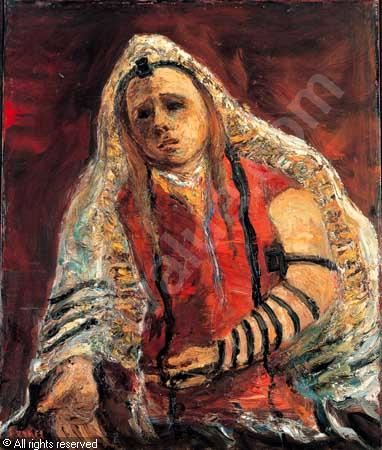 On the other hand, when one is experiencing the trauma of bereavement, one is not expected to wear the ‘diadem of joy’, the Tefillin, in the first stage of mourning before the burial. 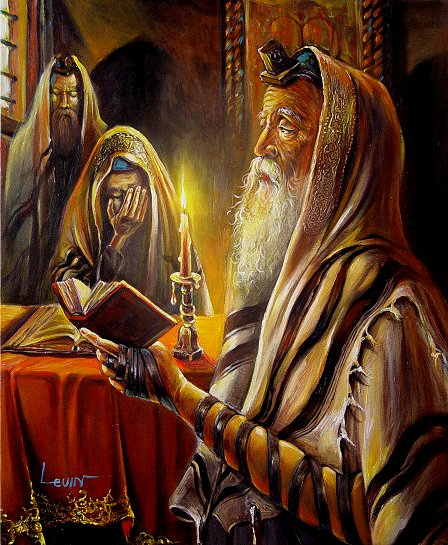 Originally, the Sages had no hesitation in exempting a bridegroom from putting on Tefillin on the morning after his wedding, arguing realistically that at such a time he could not possibly concentrate all his thoughts on them. This concentration, as we have previously noted, as well as a clean body, were the preconditions necessary for putting on Tefillin. It is a later and perhaps even more realistic view that, in fact, no one can avoid letting his thoughts wander while wearing Tefillin, and that, as the bridegroom is no exception in this matter, he should wear them. 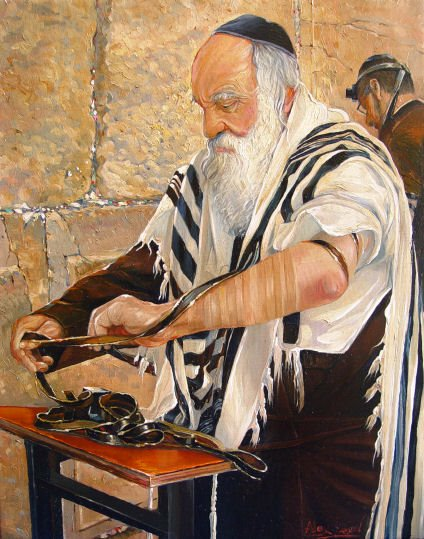 A painting of an Ashkenazi Jew putting on Tefillin near the ‘Kotel’. Because ‘Tisha b’Av’ is a national day of mourning, the wearing of Tefillin is postponed from the morning till the afternoon (‘Mincha’) prayer. When visiting a cemetery or in the immediate vicinity of the dead, the wearing of Tefillin is also forbidden. The idea underlying this is inferred from the passage in Mishle/Proverbs (17:6), “Whoever mocks the poor, blasphemes his Maker’. In this case the dead person is regarded as ‘poor’, that is, utterly lacking in the capacity to perform Mitzvot. Anyone who puts on his Tefllin near the dead is therefore showing little consideration for the latter’s state of deprivation and is, in effect, saying: ‘See! You are inferior to me because I can wear Tefillin while you cannot’. However, he may remain in the vicinity of the dead if he removes the ‘Tefillah shel Rosh’, which is the exposed and visible ‘Tefilah’, and remain only with the ‘shel Yad’, which, as we have seen, always remains covered. The Rabbis’ consideration for the dead is such that they attribute to them the feelings a living person might have had if he was deprived of this great Mitzvah. Please note that the instruction regarding putting on Tefillin listed below are halachic guidelines. To learn how to put on Tefillin, one should ask a knowledgeable person to demonstrate the correct procedure. In my personal experience the people of Chabad have the most practical know-how to teach and demonstrate how to put on Tefillin. 1. Every adult Jewish man is commanded by the Torah to wear Tefillin on his arm and head every day, except on Shabbatot and Biblical Festivals. Customs vary regarding the wearing of Tefillin on ‘Chol HaMo’ed’, the intermediate days of Passover and Sukkot. Generally one should follow the custom of the synagogue in which one prays. 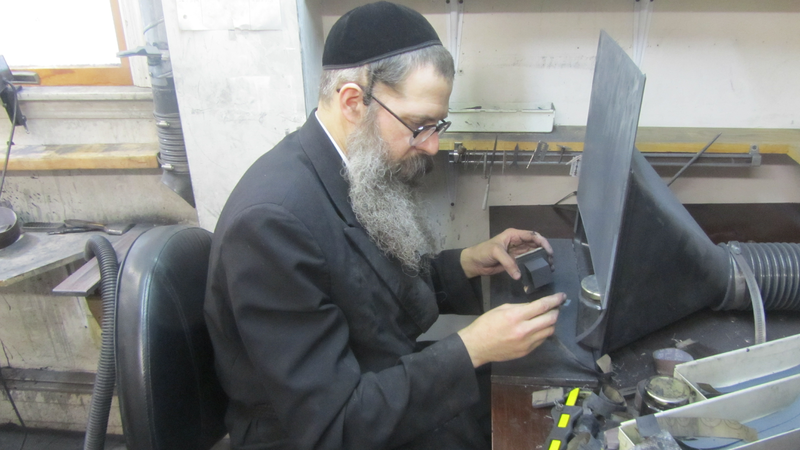 Left: a ‘Sofer’ is checking the square shape of the Tefillin for its perfection and correct black colour. 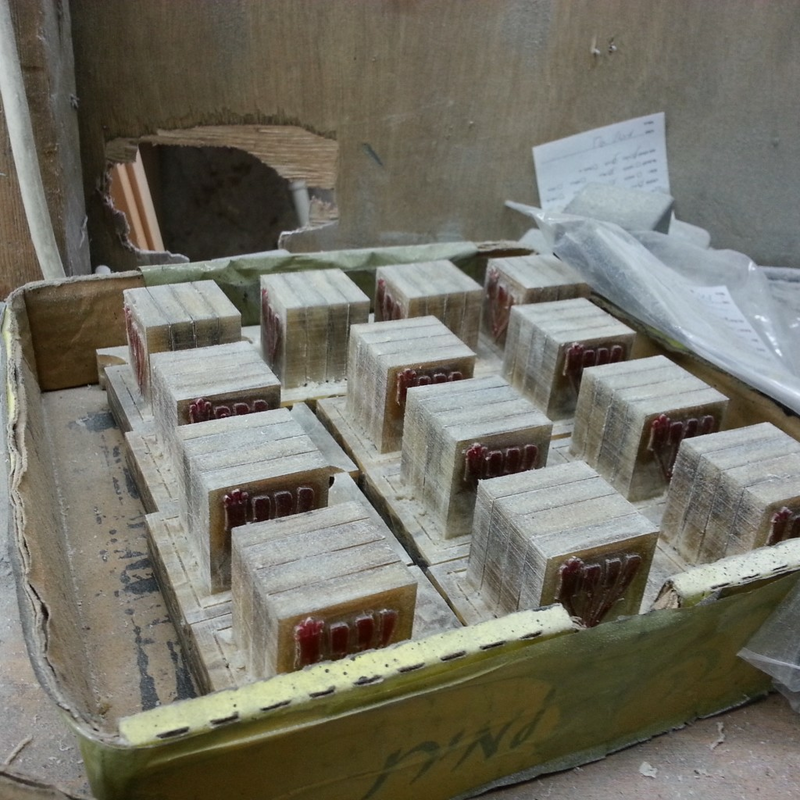 Right: Stored leather boxes after examination ready to be used by ‘Sofrim’. 2. 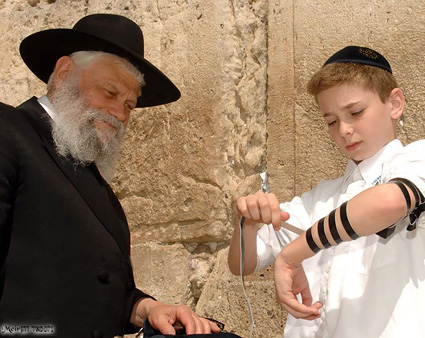 There are different customs as to when a boy starts putting on Tefillin. Most start one month before turning 13, others start two or three months before. By no means should one buy Tefillin from eBay or from an unknown Judaica-store, but only directly from a trustworthy Judaica-seller or ‘Sofer’, who has been recommended by religious people. Unfortunately there are many falsified and non-kosher Tefillin on the market, and the one who buys it, is wasting his money. 4. Although the Mitzvah of Tefillin ideally applies all day, it is customary to wear them only for morning prayers. If one did not put Tefillin on for the morning service, they may be worn any time during the day, but not after nightfall. 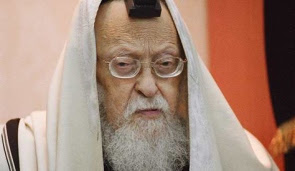 It is prohibited to sleep while wearing Tefillin at any time, even for a short nap. Since Tefillin are more holy than Tallit/Tzitzit, we follow the rabbinical rule that in matters of holiness, we strive every time to go higher. Therefore we put on Tefillin after we have wrapped ourselves in the Tallit. 6. Many people voluntarily recite a beautiful prayer before putting on the Tefillin. ‘Blessed are You, Hashem, our G-d, King of the universe, Who has sanctified us in His commandments, and commanded us to put on Tefillin’. 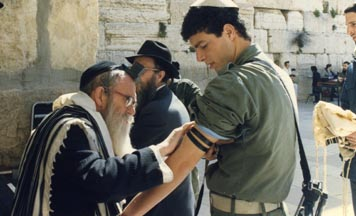 The Tefillin should be placed on the lower half of the bicep, facing forward towards the heart. After saying the blessing and tightening the knot around the arm, the strap is wound seven times around the forearm and then loosely wrapped around the hand. 8. 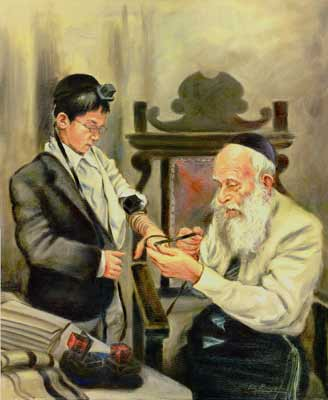 Nothing should intervene between the Tefillin and the body (‘Chatzitza’). One must therefore ensure that clothing or a band-aid does not intrude between the Tefillin and the arm or, for example, that one’s ‘Yarmulka’ does not come between the Tefillin (or their straps) and one’s head. When bandages or a cast cannot be removed, one should consult a Rabbi. 9. No interruption at all is allowed between putting on Tefillin of the hand and those of the head. One should not talk, gesture, or even answer ‘Amen’ to a blessing during this time. It is considered to be a distraction and would cause saying the ‘Beracha’ of the ‘Tefillah shel Yad’ again, which would be considered a ‘Beracha’ in vain (‘Beracha Levatalla’). This can be compared to the Halacha that we are not allowed to speak between ‘Netillat Yadayim’ and ‘HaMotzi’. 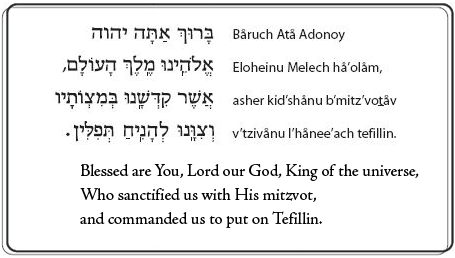 ‘Blessed are You, Hashem, our G-d, King of the universe, Who has sanctified us in His commandments, and commanded us regarding the commandment of Tefillin’. ‘Blessed is the Name of His glorious kingdom for all eternity’. 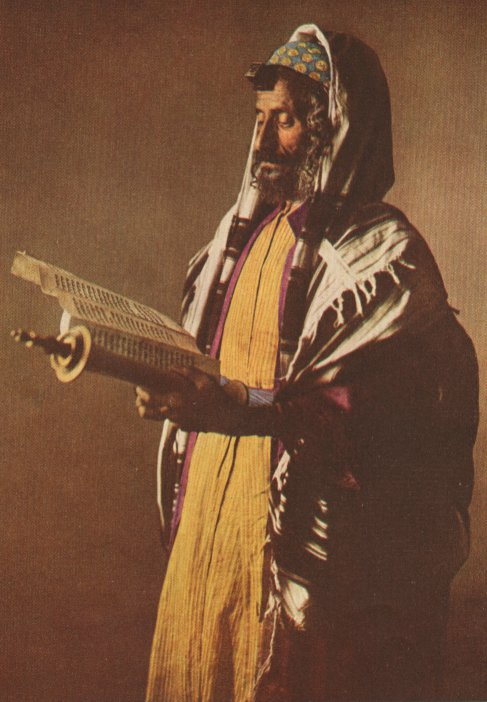 A Yemenite Jew wearing Tefillin while reading the Scroll of Esther on Purim. ‘I will betroth you to Me forever, and I will betroth you to Me with righteousness, justice, kindness and mercy. I will betroth you to Me with fidelity, and you shall know G-d.’ (Hoshe'a/Hosea 2:21-22). 12. The remaining length of strap is then wrapped around the hand. One should ensure that all the straps have only the black side showing. 13. While wearing Tefillin, one should be aware of them and touch them occasionally to remind himself that he is wearing them and to ensure that they are placed correctly. 14. It is obligatory to have a clean body and pure thoughts while wearing Tefillin. One should not enter a bathroom while wearing them, and one who needs to relieve himself should remove his Tefillin immediately. Above: Rabbi Ahron Daum praying with Tallit and Tefillin at the prestigious synagogue of Tachkemini School. 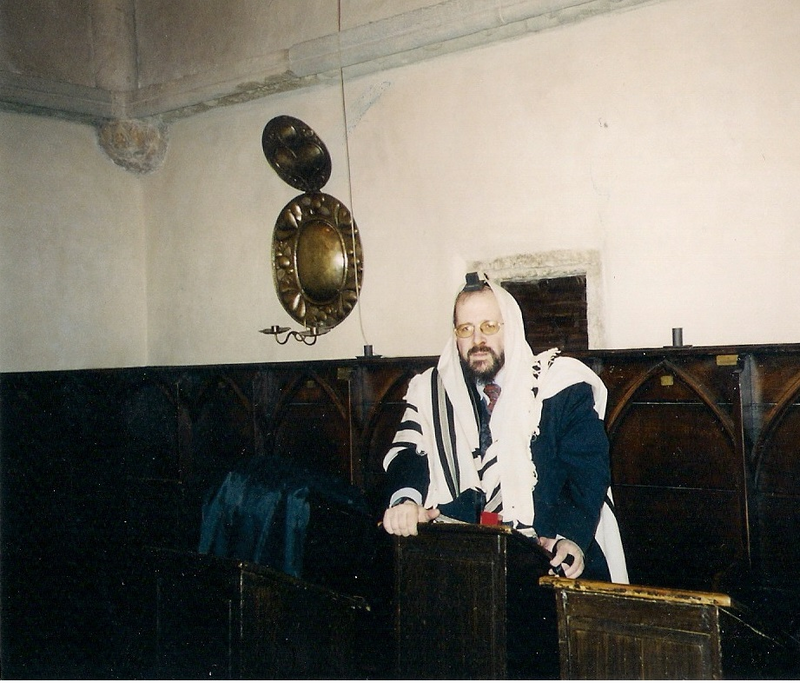 Below: Rabbi Ahron Daum praying in the historically important synagogue ‘Alt-Neu’ in Prague where the famous Maharal of Prague (1520-1609 C.E.) used to pray. 15. The Tefillin should not be removed until the end of the morning service. They should be removed while standing, reversing the order in which they were put on. One first unwinds the strap from the fingers, then removes the Tefillin of the head and puts them away in the right side of the Tefillin bag. The Tefillin of the arm are then unwound and put away in the left side of the Tefillin bag. 16. Tefillin are objects of sanctity and are stored in special containers to protect them. 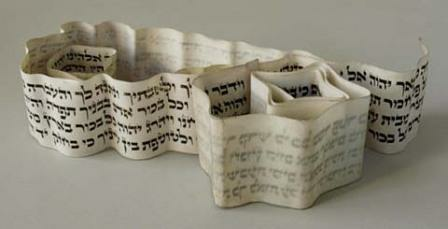 They are kept in a bag specially made for the Tefillin, usually decorated or embroidered. They should not be placed anywhere that is disrespectful or dirty. 17. The Tefillin must be completely black (including the straps on one side) and precisely square. If one notices any cracks, loss of colour or rounding of the corners, one should consult a Rabbi or scribe before using the Tefillin again. It is best to consult one immediately in order to have proper Tefillin for the next day. 17 If the Tefillin themselves fell on the floor accidently, halachically one should fast for a day or donate a significant amount of Tzedakah and one should consult a competent Rabbi. 18. Tefillin that are worn out should not be thrown away, since they are objects of ‘Kedushah’, sanctity. A Rabbi should be consulted as to how to dispose of them correctly. 70th ‘Yahrzeit’ (death anniversary) of my mother’s family who were deported and murdered in Auschwitz by the Nazis on this fatal day.